Once again during our weekly days off we tried to squeeze in a National Park or two. Luckily for us, Mesa Verde National Park is just 2 1/2 hours away from Ridgway State Park in southwestern Colorado. Mandy has been lobbying pretty hard for a visit to Mesa Verde, so happily we finally made it! Consult the Mesa Verde wikipedia page for a more in-depth discussion of the area’s history and culture. The mesa area has an abundance of structures. It is estimated that at its height, the Mesa Verde region housed more than 20,000 people, at the beginning of the 13th century or c. 1285. By the next century, Mesa Verde was empty. It is thought that long drought, overpopulation, resource decline and overdependence on maize precipitated the decline and eventual exodus from the mesa. The exodus may have been very rapid, as evidenced by the pottery and other tools and possessions left behind. The Ancestral Puebloans long inhabited the mesa, which stretches from north to south for about 20 miles and rises gradually towards the south. The first humans to inhabit the area may have done so around 6500 BCE, and were hunter-gatherers following large game. It is not clear whether these peoples inhabited the mesa area permanently or temporarily. The mesa top is punctuated by canyons, and this is where you will find the cliff dwellings. 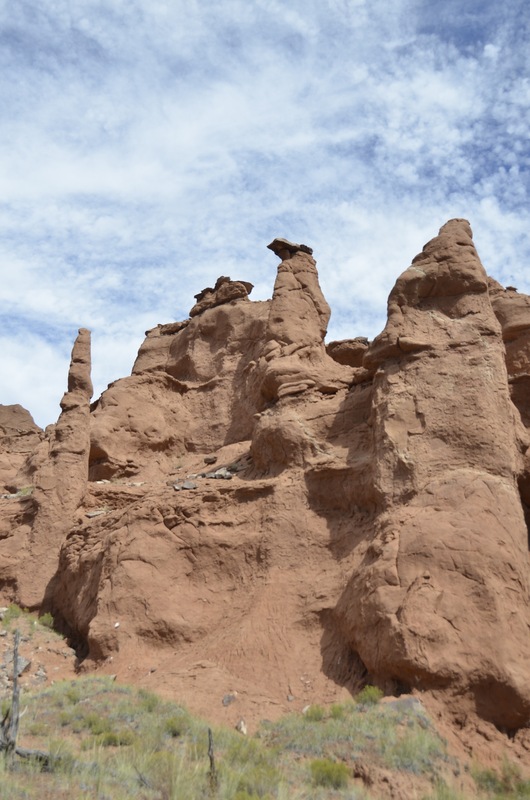 To visit the cliff dwelling you will drive across the top of the mesas. Stairs or a steep pathway will lead you down to the cliff dwellings, which were mostly sandstone, timber and plaster mortar. The Puebloans began building these more complex structures around c. 1075. The cliff dwellings contain many adjacent rooms, towers and kivas. All are found under a sheltering cliff or recess in the canyon walls. The kivas are a circular structure sunken in the ground and were typically 12 to 15 feet across. Kivas were accessed from the smoke hole in the roof by ladder. The firepit can be found directly under the hole in the roof. A cooling tunnel was usually built into the side of the kiva, with the air flowing from a hole near the floor, which was blocked by a diversion stone, to keep the airflow from extinguishing the fire. A sipapu was typically a small pit dug in the north of the kiva and symbolized the peoples’ emergence from the Underworld. One of the cliff dwellings has a nice reconstruction of a kiva, complete with the roof and ladder, cutaway so that you can see the construction. Kivas may have been both ceremonial and residential. A single village may have housed 100 people or multiple families in a small clan. The villages or cliff dwellings were always located near a water source and were accessible to the fields, which remained on the mesa tops. Prior to the cliff dwellings, the Ancestral Puebloans lived in multi-roomed structures on the mesa tops, close to the fields and check dams which were constructed to control the flow of water. Prior to the multi-room structures the Puebloans lived in pit dwellings, which were a precursor to the kiva. There are several fine excavations of pit dwellings to explore in the Park. 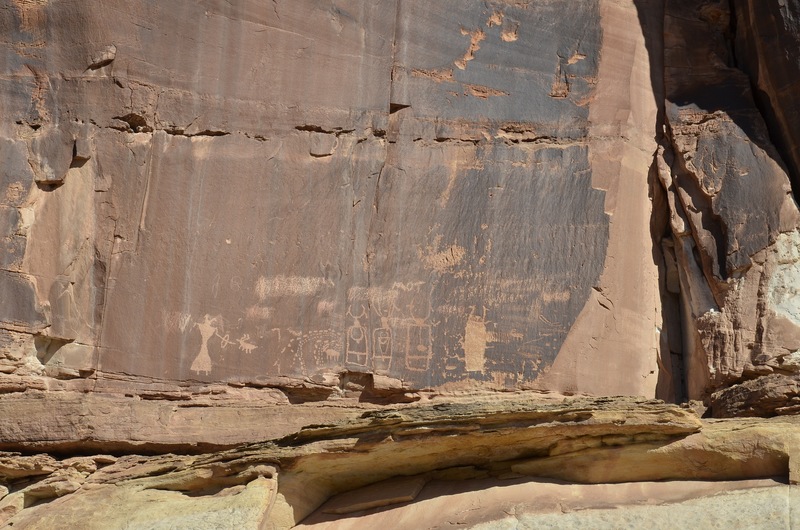 There are also petroglyphs, which predate the cliff dwellings by centuries. We enjoyed the talk and flute performance by our ranger guide, David Nighteagle. We’ve been exploring farther and farther abroad on our days off from work here at Ridgway State Park, Colorado. We were very pleased to find out that Moab, Utah is only a 3-hour drive by car, across some gorgeous country. 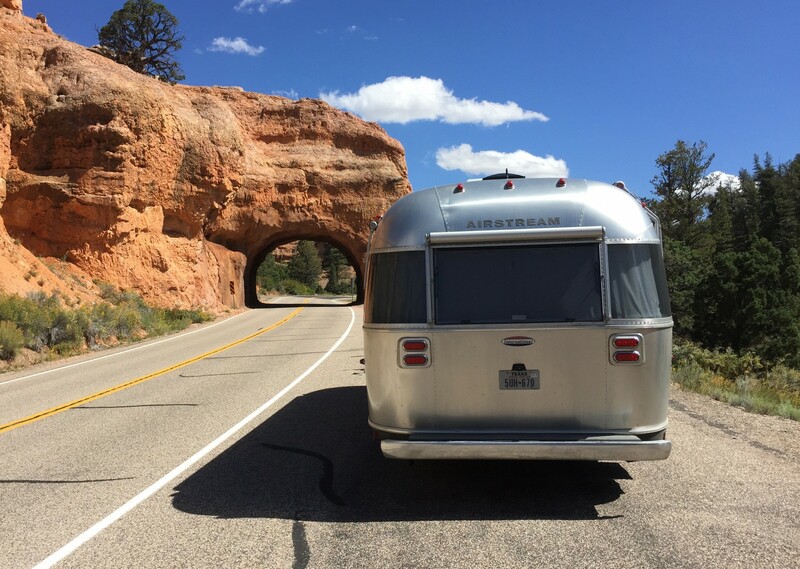 The route takes you across a mountain pass (Dallas Divide) with awesome up-close views of the Sneffels Range, through canyons and gorges and around another big mountain range, the La Sal Range, which lies southeast of Moab. The La Sals attain 13,000 feet and are the second-highest range in Utah. The town of Moab has about 5,000 inhabitants and is centered between two national parks: Arches and Canyonlands. The opportunities for adventure here seem endless, with whitewater rafting, extreme mountain biking, hiking, climbing, bouldering, canyoneering, horseback riding and so on. We stayed in a tiny tent-only urban campground, the “Up the Creek” campground, just off the main drag. It was very nice to hear the gurgling of adjacent Mill Creek all night. After arriving about 11 a.m. we set up our tent and headed into Arches N.P, the entrance of which lies about 5 miles north of Moab. The entrance into Arches has to be one of the most dramatic of any national park. You drive in low in front of a series of red sandstone cliffs looming over 1,500 feet above you, in close proximity. The entry road takes off immediately up and over these cliffs, such that you soon have a commanding view of the region and feel as if you have reached the top of a plateau. Indeed, you are on the Colorado Plateau. The Colorado Plateau is a large, distinct physical region centered on the four corners region of Colorado, Utah, New Mexico and Arizona. It was once covered by an inland sea which deposited an underground salt bed that is thousands of feet thick in places. This unstable salt bed is overlaid by a mile of rock. Instability began to create faults in the rock surface. Over time these faults developed into fins of rock through the process of erosion. As erosion continued, softer rock fell out of the fins and the hardiest fins developed into arches. Double-O Arch. Note the scale figures. We decided to drive as far as the road goes, about 16 miles, to the Devils Garden trailhead. The initial trail, to Landscape Arch, is relatively flat and easygoing. But if you want to leave the crowds behind, venture beyond Landscape Arch into the further reaches of Devils Garden. The first thing you get to do on this trail is climb a giant stairstep made of slickrock. And the rock truly is slick, due to the sand that seems to cling to every surface. As we approached this stairstep formation, a woman coming down was actually screaming that she couldn’t make it. It is pretty intimidating coming down, knowing one false step will send you scuttling into the chasm. She took it slow and with some guidance made it down, but was very upset. She definitely needed more appropriate footwear. It is interesting that the National Park service has taken the stance that you are pretty much on your own in the wild and even not so wild portions of the parks. There are abundant opportunities for you to shorten your life in every park. Think of the incidences of people taking selfies and backing up and off a cliff. Be careful and bring the right equipment! On the way out to the Double-O arch we encountered Navajo Arch and Partition Arch. In both place you can climb into the arch itself, which is not recommended as these formations are still forming! There was a picture at one of the viewpoints of a giant slab of stone coming loose from the underside of the arch that someone actually caught on film. On the way to Double-O the trail goes over some very slender fins of rock with plenty of room to fall on either side. Not a trail to take if you suffer from vertigo. This was called a primitive trail, for good reason. There was a loop to go back a different way that we didn’t take and for good reason. One couple back at the start told us that they almost called it quits several times taking this trail back; it was that extreme. On the way back to camp we stopped at the old Wolf Ranch to take in some rock art. This is more recent, dating anywhere from the 1650’s to the 1850’s, after Europeans introduced horses to the Americas. Since this was kind of a whirlwind trip, we had only one day to explore Arches and one for Canyonlands. The approach to Canyonlands takes off about 10 miles north of Moab and continues, up and up, for about 20 miles to the west, towards the confluence of the Colorado and Green Rivers. This road leads into the Islands in the Sky quadrant of Canyonlands National Park. And the name is apt. You don’t get many glimpses of the rivers, far, far below, but you do get the sense that you are in some ethereal world, floating above the desert floor. The land falls away in all directions, with the vistas originating from mesas resting over 1,000 feet above the land below. 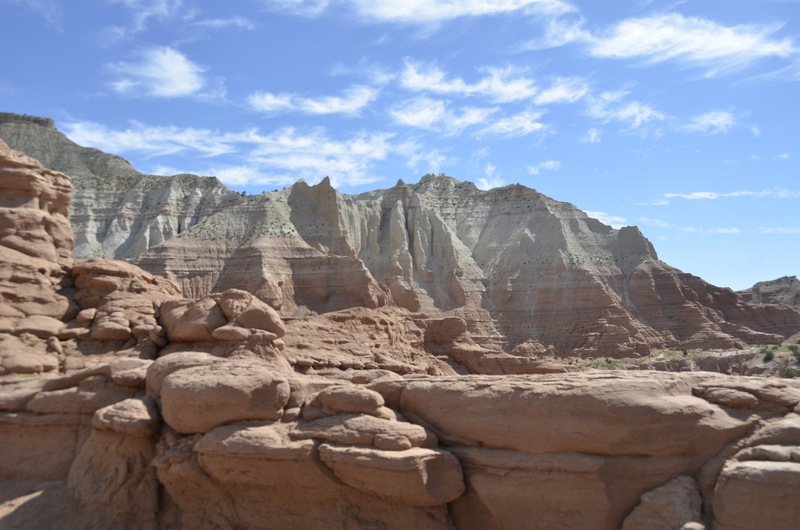 If you are very adventurous, there is White Rim Road which follows the base of the cliffs, but it is 100 miles of no water, hardpan and dust. You can see the road leading off into the distance in the next photograph. It used to serve as a way for ranchers to get their sheep to water. This is once again big sky country, with vistas to distant mountains in Colorado on clear days. It is somewhat reminiscent of the Grand Canyon, but the scale is so huge that is hard to place oneself in that context. 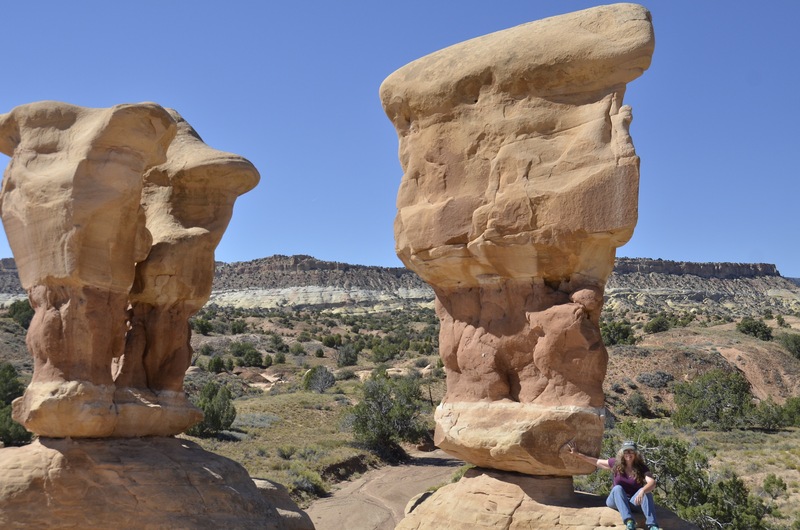 There is a very famous arch in the Island in the Sky quadrant known as the Mesa Arch. Photographers were clambering for their chance to stand at the mouth of the arch to take their photo since one can capture the distant canyons through the arch. If you really want to beat the crowds, arrive at sunrise for a truly spectacular photograph. I will close with a nice shot of a gathering thunderstorm looming over the cliffs, and a distant view over all the formations. For the way back to Ridgway, we started out by taking State Road 128, which leads upstream through the canyon of the Colorado east of Moab. A truly spectacular road with few travelers. It has been discovered by canoers, kayakers, and stand-up paddleboarders. Most of the trails above 9,000 feet are still snowbound now, in early May in Colorado. So, on our two days off this week we chose to visit the nearby Black Canyon of the Gunnison National Park, which lies about 15 miles to the northeast of Montrose, and a 45-minute drive from our home-base, Ridgway State Park. I had vague memories of visiting as a kid, but it was during this visit that I really came to love and appreciate it. I would say, for the reasons I outline below, that I enjoy the Black Canyon even more than the Grand Canyon, and that’s saying a lot! The Black Canyon was formed over the last 2 million years as the rapidly falling Gunnison River cut its way through some very old Precambrian metamorphic rock that was in place some 1.7 billion years ago. The river falls an average of 96 feet per mile in the National Park, so it is that action along with the turbidity of the water that cut the canyon so deep and so narrow. There is a nice rim road on the south side of the canyon which has numerous overlooks reached by short trails. From almost everywhere along the rim one can hear the roar of the Gunnison, at work below. I don’t recall being able to actually hear the Colorado rushing through the Grand Canyon, although one can see it in places. For me, the scale of the Grand Canyon is too overwhelming and therefore hard to put into perspective. The Black Canyon, on the other hand, can be taken in and understood on a much more intimate scale. In the book, Images of America: The Black Canyon of the Gunnison, author Duane Vandenbusche states, “Several canyons of the American West are longer and some are deeper, but none combines the depth, sheerness, narrowness, darkness, and dread of the Black Canyon.” I would have to agree with that statement. A singular rock face, the Painted Wall, is roughly 1,700 feet high. The canyon itself averages 2,000 feet in depth. At its narrowest it is 1,000 feet across at the top and only 40 feet across at the bottom. In some places light may only reach the bottom for 30 minutes per day, thus the canyon’s name. The Park was a National Monument, established in 1933, but it is now the newest National Park, established in 1999. This year, 2016, marks the 100th birthday of the National Park Service. If at all possible, plan to visit a national park or two during this centennial year celebration! All in all, we found the Black Canyon experience to be an eye-popping awakening. The vistas are in constant flux and it is fascinating to watch the light change throughout the day. We were here on a nearly cloudless day, so the canyon walls were rendered brilliantly. Part of me really wanted to explore the bottom of the canyon, but it is basically inaccessible to all but the most intrepid hikers and climbers, via a trail system that is not managed. Even more unlikely would be a trip down the Gunnison through the canyon. Class V rapids abound, with many extremely treacherous portages. Suffice it to say, the canyon is best viewed from the relative safety of the rim. We did take one managed trail about 400 feet down into the canyon. Strangely enough the trail is called Oak Flat, but it is anything but flat. It is an awesome experience to leave the hustle and bustle of the rim road and experience the quiet interior of the canyon. One of our favorite hikes was the Warner Point trail, named for a Montrose minister that rallied to have the canyon preserved in the 1920’s. From the end of the point one can see in all directions, with the majestic San Juans to the south, the Elk Ridge Mountains to the north, the Uncompaghgre valley to the west, and the Black Canyon to the east. The canyon, as a raparian zone, is teeming with life. We saw many types of birds, including Golden Eagles, Magpies, a Grouse and Violet-Green Swallow, as well as a marmot. Spring is just beginning to show as well, as evidenced by several early wildflower varieties and the beginnings of cones on Douglas Fir. During his winter visit to Oregon, our son decided to hike the Appalachian Trail, a 2,185 mile proposition. The logical time to start was around March 15th, as a hiker must reach Mt. Katahdin, Maine by October 15th, when Baxter State Park closes for the winter. Mandy and I decided that we would take him to the start of the trail at Springer Mountain, Georgia, to see him off properly. The motto on the plaque says, “a footpath for those who seek fellowship with the Wilderness.” There couldn’t be a better reason for undertaking such a commitment. We struck out from Texas on March 11th, bound for Georgia, with the Airstream in tow. We set up camp at the Plum Nelly campground in Ellijay, Georgia upon our arrival on March 13th. Levar was ready to hit the trail on the 14th, but the first thing one must do is register as a thru-hiker at Amicalola Falls State Park. Levar was the 658th person to register this year, so he was bound to have some company on the trail. Upon registering, it is traditional to weigh one’s pack and have one’s picture taken at the arch marking the start of the Approach Trail. Despite all the careful research, planning and paring down, Levar’s pack still weighed in at 41 pounds! Packs these days can weigh anywhere from 25 to 75 pounds, depending on how much food and water one carries. Rather than carrying weeks worth of food, as one must do on the Pacific Crest Trail or the Continental Divide trail, as resupply points are so far apart, Levar decided to carry 4 to 5 days worth of food to lighten his load, as towns are closer together on the Appalachian Trail. He also carried a good water filter, to resupply water at the many creeks and springs one encounters on the trail. As you can see from the sign above, the Approach Trail to Springer Mountain, the official southern terminus of the trail, adds an unnecessary 8.5 miles over 1,000 feet of vertical climb up steep terrain to the trek. We found out that we could get close to Springer Mountain on Forest Service roads, so took Levar to within 1 1/2 mile of the summit. We hiked with Levar to Springer Mountain. There we found a group of other beginners, a notebook to sign, and a copper plaque marking the start of the trail. Learn more about the origins of the trial here: How the Appalachian trail got its start. After Springer Mountain, we saw Levar off with some pictures to mark the occasion. Note the white blaze on the tree. There are several thousand of these trail markers on trees and rocks, so one can be assured one is on the right path. While Levar made time on the trail, Mandy and I hiked some other sections of the trail and some surrounding trails, before meeting at the highest point on the Georgia section of the trail, Blood Mountain, on March 17th. We approached from the north while Levar approached from the south and we reached the summit almost simultaneously. A gracious CCC-built shelter is built into the rocks on the summit. The CCC, Roosevelt’s New Deal Civilian Conservation Corps, were responsible for the construction of many segments of the footpath and shelters: 75th anniversary of the AT. Levar was in excellent spirits and physical condition, and was going strong for these first 30 miles of the trail. We relaxed awhile on Blood Mountain and took in the spectacular views. One really gets a sense of why these mountains are called the Blue Ridge. After descending from Blood Mountain, the footpath passes, quite literally, through Mountain Crossings at Neels Gap. This is the only spot on the trail where the trial passes under a roof: Mountain Crossings. This building was also built by the CCC, in 1937. It serves as the first contact with the outside world, a way station of sorts, a hostel and a place for a warm shower. The folks at Mountain Crossings offer a free service to thru-hikers: the pack “shakedown”. Levar decided to take part in this service. Staff have you take everything out of your pack and lay it out on the floor. Then comes the discussion about what ought to be jettisoned and what should stay. Thru-hikers send pounds of equipment either home or forward on the trail to save weight. Levar was told that he should do away with his sound-recording equipment and some other things, so these were sent ahead so that once he incorporates them in his pack again, he’ll be physically better able to handle the weight. After a hike to the next mountain after Neels Gap, we finally parted ways with Levar. As of this writing he is hiking through the Great Smokies National Park on the Tennessee/North Carolina border. I am posting this sunset photograph as a token of one of the many rewards of hiking the Appalachian Trail. These are Steller or Northern sea lions, an endangered species, although their numbers have increased in some areas in recent decades. They are the largest of the eared seals, and are a favorite snack for the Killer Whale. We observed these at Cape Arago State Park, near Coos Bay. 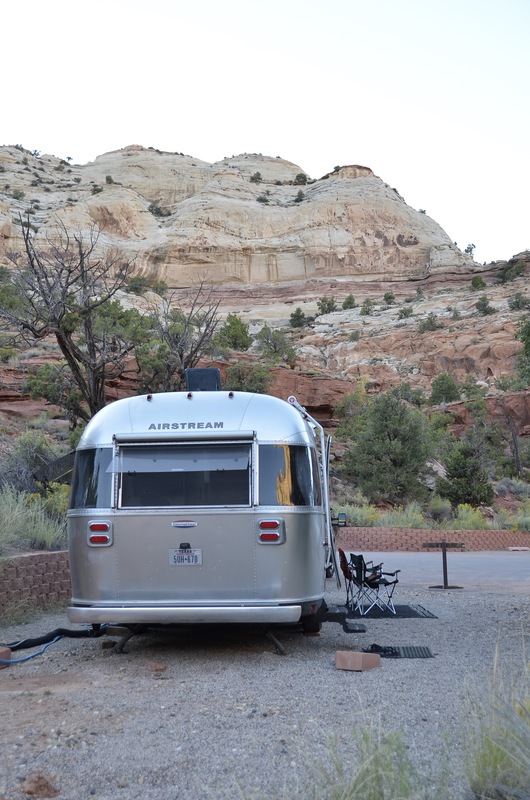 There is a great deal of history behind the Airstream travel trailer. Founded in the 1930’s by an adventurous sort, Wally Byam, the company has held true to its early principles. Excellent design, affordability, and life on the Open Road. Modern Airstreams look pretty much the same as their early predecessors. Aerodynamics, efficiency, good craftsmanship, lightweight modern materials, fuel economy and revolutionary attitude all define an Airstream. We were happy to find our own Airstream in East Austin, from a young couple who had lived in it while remodeling their bungalow. That meant that there were very few miles on it and it was in great condition. Right now I’m typing while listening to Pearl Jam over the awesome sound system. Perks. So all in all, it’s not so bad being cooped up in our little home on the frequent rainy day. On the other hand though, it’s good to get out. There hasn’t been a whole lot of work for us in this winter campground here on the Oregon Coast. I know we’ll be very busy at our Summer camp host posting in Colorado, at beautiful Ridgway State Park in the Southwestern part of the state. Please stop by and see us if you’re in that part of the country. We’ll be there April 15th-Labor Day, 2016.
to the base of each waterfall and a 1 mile hike to the top of Golden Falls. Each hike has its own reward. The base of Golden Falls is astounding. Apart from the roar of the heavy waterfall, the colors and mist make it a real treat. The trek to the base of Silver Falls is similarly rewarding. And the view from the top of Golden Falls is golden. Up next, a trip to the Ocean with the kids. Meanwhile, hello again Silver Chariot! Rain, rain and more rain. This is the southern Oregon coast in the winter. We’ve been here 8 days and it’s rained on and off every day. Hard rain, dripping rain, light rain and blowing rain with high winds. Today was a day off for us and we took full advantage of it. Why? Because it was partly cloudy with NO rain chance! We headed for the Oregon Dunes National Recreation Area day use access. There we found a 4.5 mile loop trail that traverses the giant dunes sandwiched between the forests and the surf, stretching for 20 miles to the North and 20 miles to the South. The trail is a wonderful way to experience the ecosystem particular to the dunes. The dunes are home to fox, coyote, deer, rabbit, hare and a myriad of birds. Go a little ways inland and you’ll find bear, cougar, wolf, marten, beaver, fisher and bobcat. Not to mention streams full of salmon now in spawning season. Just offshore travel gray whale and orca. Once we made it to the shore we scanned for gray whale, as it is smack in the middle of their migration period to the Gulf of California. We did not see any, but sensed that they were out there. We’ll keep looking. The surf was dangerously high today, following the windstorms of the past several days, at 10 to 15 feet. I am told that the surf was at 30 feet during the height of the windstorm. It is thrilling to hear the ocean’s roar as you are traversing the dunes. You catch glimpses of the surf as you go along, until you cross the last high dune and there it is in all its dangerous majesty; the pounding surf. One thing that really caught our eye today was the foam that the waves left behind. With the wind heading up the beach, the foam breaks up into animistic blobs and scurries up the beach, like some cute imaginary creatures from Miyazaki’s My Neighbor Totoro. The huge driftwood logs too look like something from another world as you gaze up the beach through the mist. The windblown sand makes for some pretty interesting shapes as well. I took these photos from the crest of the dune closest to the surf as we turned to head back across the dune world. The grasses are beautiful, but it turns out that it is an invasive species – Dune Grass brought in from Europe to control erosion. The Western Snowy Plover is on the endangered species list and is facing extinction due to habitat loss. The Plover needs open sand to live and the successful spreading grasses are eradicating their homes. We saw some Plovers as we made our way down the beach. They are similar in size to the common Sandpiper, but are fluffier, with gray feathers on top and a white belly. 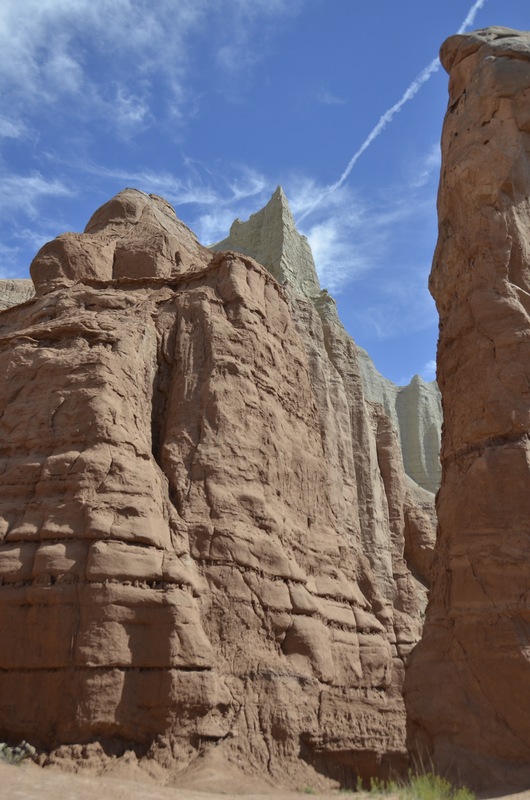 Impossibly tall spires, pinnacles, monuments, ramparts, towers, precipices, aeries. 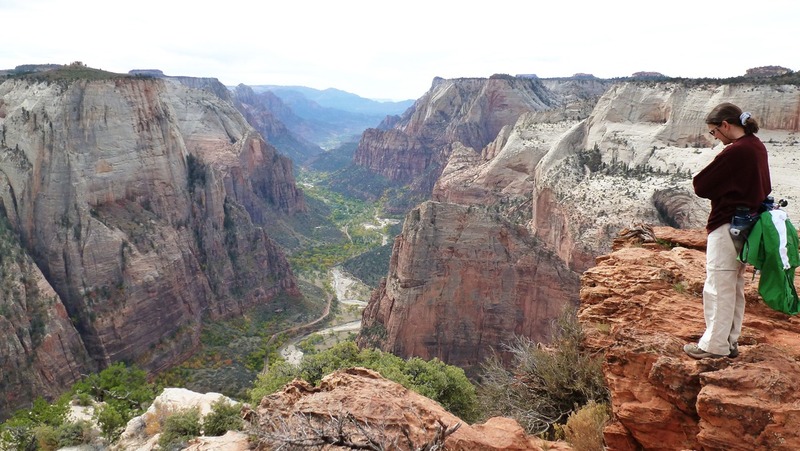 These are some of the descriptive elements that make up the experience that is Zion Canyon. For me, the experience of entering Zion Canyon for the first time was an emotional one. I was simply overcome by the feeling that a place like this couldn’t possibly be for real. Indeed, some of the first Europeans to enter the canyon described a place that people simply couldn’t comprehend. A place with walls and formations so tall that they were surely home to angels. 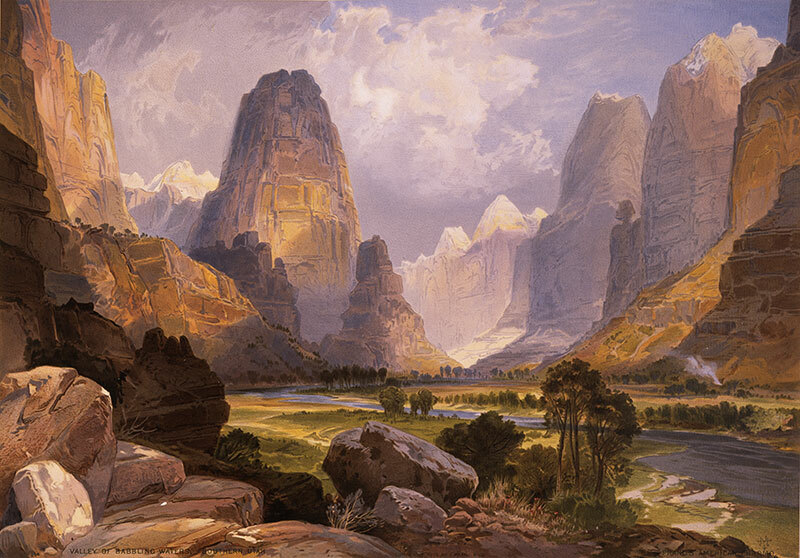 The great nineteenth-century American landscape painter, Thomas Moran, did a noble job capturing the vistas of Zion Canyon. Apparently though, when these paintings were exhibited back east they were met with disbelief. Surely Moran was painting a fantasy world, not the real world. 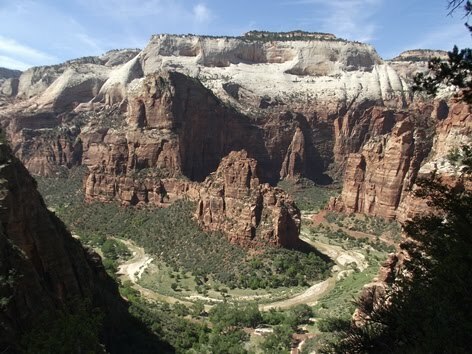 Zion is also a place that is sacred to the original inhabitants. Apparently, these people never ventured into the Canyon, for fear that they would not return from the Spirit world. When the first Mormon pioneer went in the canyon overnight and emerged in the morning, the people thought they were seeing a ghost. When photographs and paintings of Zion were shown at the 1904 World Exhibition in St. Louis it spurred a great deal of interest. Designation as a National Park followed in 1919 and soon people began visiting the Park in greater numbers, with the advent of the automobile. In the 1930s a road (the one we entered on) was built entering Zion Canyon from the East. This Road features a mile-long tunnel high on the canyon wall and a series of switchbacks spiraling down to the canyon floor. This road must have been quite an engineering feat for its time. If a vehicle pulling a trailer approaches the tunnel then traffic must be blocked and the vehicle escorted through, due to the narrowness of the tunnel. The photographs in this blog entry are not mine. Rather, they are selected from the internet. I forgot my camera on this trip and even my iPhone died, so I couldn’t take my own photos. 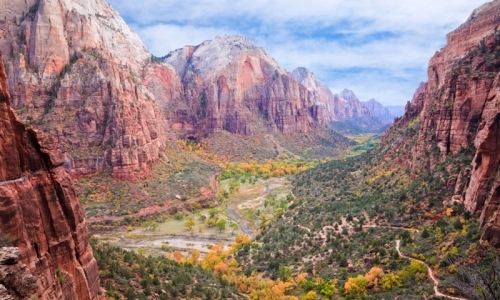 I think the photographs do an amazing job of capturing Zion in all its magnificence. The photos show the canyon both from above and below. The canyon itself was carved over eons by the Virgin River. 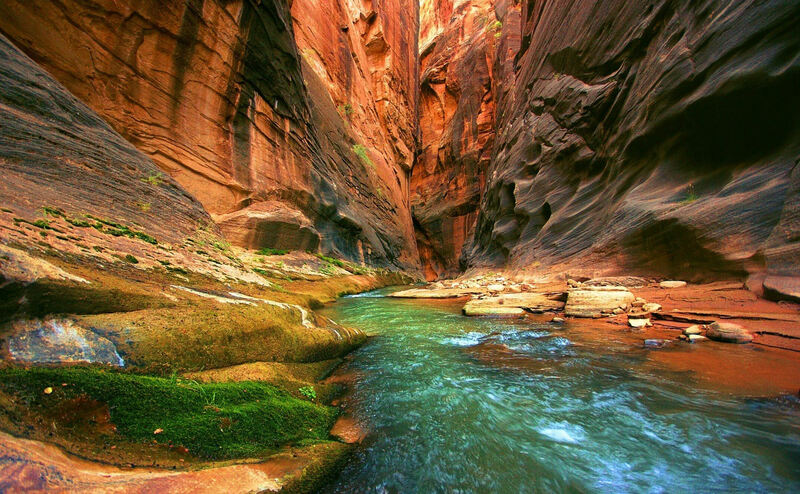 The Virgin River always has water, and one of the great experiences in Zion is walking in the river as one explores what is known as The Narrows. The Narrows goes on for miles, and must be the tallest slot canyon anywhere. The highest walls in the canyon rise over 3,700 feet. I suppose that the bottom of Zion Canyon must approximate the feeling of being in the bottom of the Grand Canyon. The walls of Zion go straight up though, whereas the Grand Canyon walls step back. It also reminds me of Yosemite Valley. Rock climbers are drawn to both places for world-class climbing. These walls are best left to the pros. We took the Grotto Trail to some wonderful pools at the base of a large formation. There are lower waterfalls where the upper pools empty into a natural amphitheater. Climbing the trail a little higher takes one to an otherworldly place where a misty waterfall hundreds of feet high empties into the upper pools. The waterfall when we were there was just the lightest mist, such that the waterfall could not be seen from a distance. Zion is near the top of the Grand Staircase. 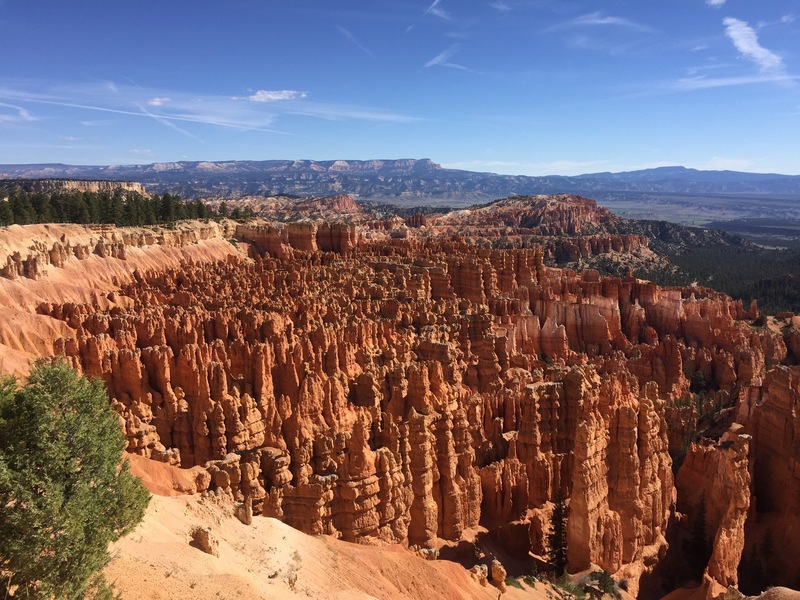 The staircase starts in Arizona near the Grand Canyon, rises to the Vermillion Cliffs on the Utah border, rises to Bryce National Park and Zion National Park and reaches its pinnacle at Cedar Breaks National Monument to the north of Zion. All told the staircase rises over one mile. Camping in Zion was a joy. The campground is surrounded by the canyon formations. In the dark of night the formations still loom – taking on an almost eery presence. Watching the sun set and rise on the canyon walls is delightful. The dark, colorless formations begin to emerge in their colorful glory as the morning progresses. I recommend visiting Zion in the early Spring or late fall, to avoid the crowds and to visit when it’s not so brutally hot, as it is in the summer. Zion Canyon is served by a shuttle that takes visitors from point to scenic point, which is a relief from the pollution that used to be caused by so many cars in the canyon at one time. Yosemite Valley should finally enact a shuttle system, to protect those formations from pollution. 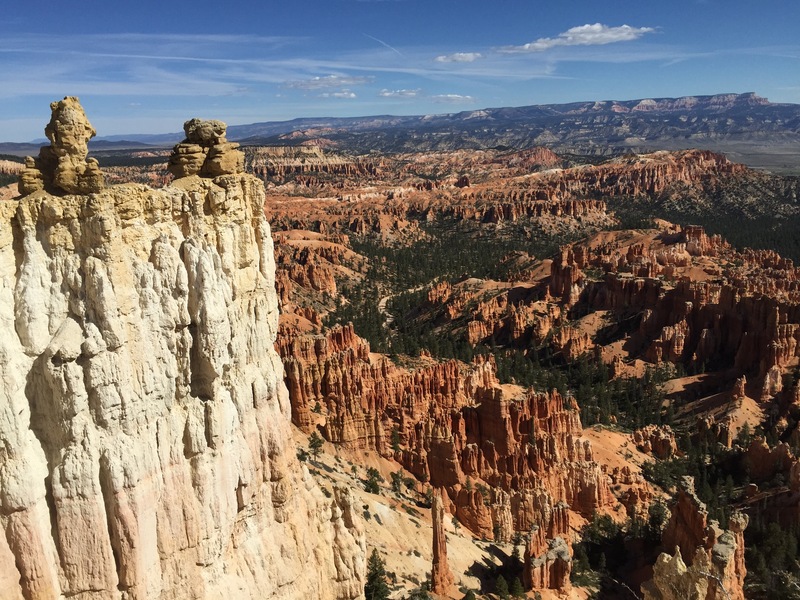 Today we returned to one of our favorite National Parks, Bryce Canyon. 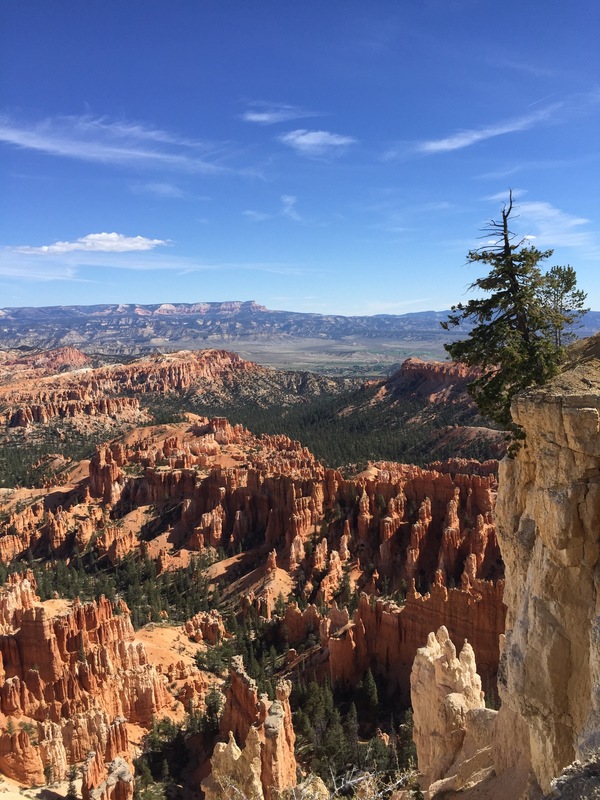 It is almost always cool in Bryce, for the elevation is between 8,000 and 9,000 feet. That’s a good thing. The only drawback, though, is that I always need 3 to 4 days to acclimate to higher elevations before I can undertake serious physical exertion. Mandy’s in the same boat. The last time we were here, two years ago, we hiked down into the canyon without acclimatization. We were huffing and puffing like mad and our hearts were pounding in our chests, with the slightest rise in the trail. It was well worth it, though, as the canyon is so much more magical when you go into the land of the hoodoos. I remember back in 2005, visiting the Grand Canyon and being struck by how still and quiet it was once one leaves the bustling perimeter. We didn’t go far down the trail, but the memory of the grandeur and solitude will always be with me. 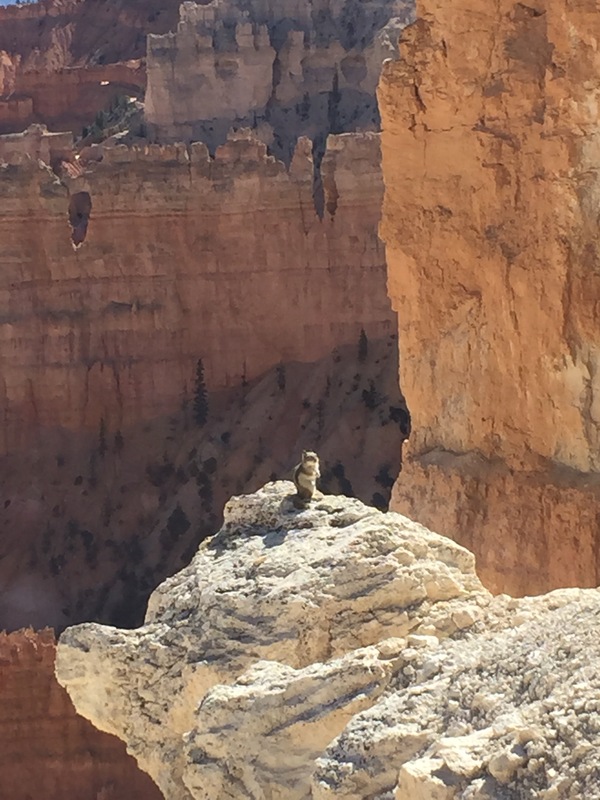 The same is true at Bryce Canyon; once one leaves the crowds behind one is witness to a whole other world. Words can’t adequately describe the beauty of the landscape below the rim of the canyon. 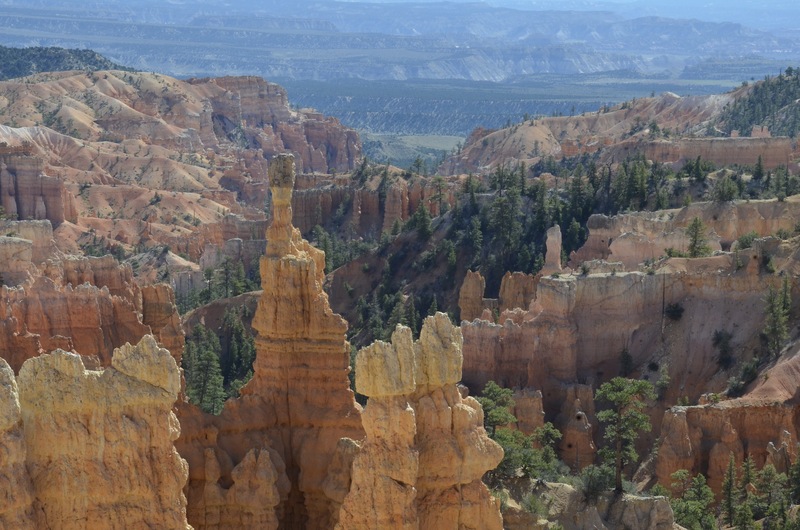 The hoodoos begin to take on an anthropomorphic presence; like being in the land of giants. Furthering that impression, the hoodoos and other structures have a spiritual quality, leaving one awestruck and feeling very deferential towards the giant figures. People like to associate the figures with the shape of a face or an animal, such as the Queen Victoria hoodoo. 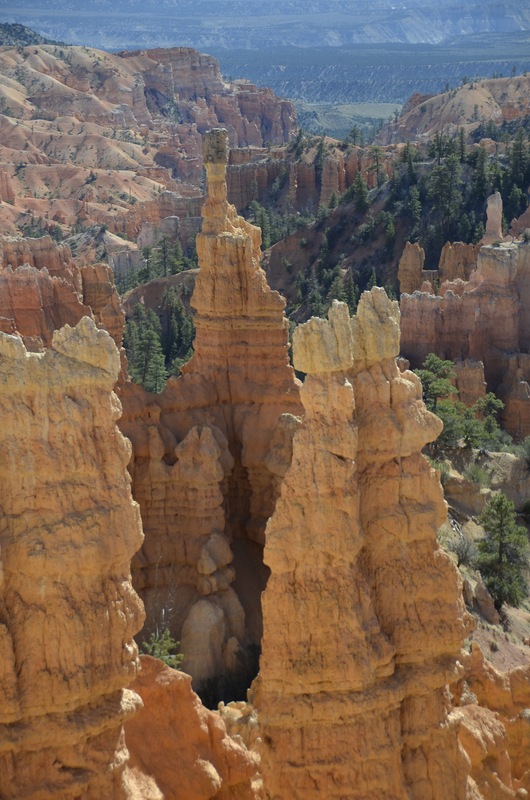 I prefer to disassociate the figures from an association with something familiar and comforting, such that the hoodoos begin to emerge almost as mystical beings, with an energy all their own. This time around, although we would have liked to descend again into the land of mystical beings, we decided to stick to the Rim Trail. We were not disappointed. One can walk along the rim for roughly 5 miles before that trail as well descends into the depths. The landscape is constantly unfolding new mysteries and visions as one makes ones way along the rim. The hoodoos, arches, canyons and other otherworldly structures are interesting to see as they are different from every angle. Oh, and the colors are out of this world! There is the familiar (to the Utah desert) red sandstone in every shade, oranges and even purple. If I was a landscape painter I would love to soak in the majestic scene and render it on canvas. That said, the scene is so hard to convey in mere photographs and similarly only the best painter could convey the immensity of impressions and grandeur of it all. I’ve done my best to photograph some aspects of the canyon, but the digital image is a poor means to describe all that one sees and feels peering into that landscape. On our first night after hiking the first half of the Rim Trail, we settled in to watch the light change the landscape as the sun set. The hues and patina of the setting changed dramatically as the light falling on it dwindled. Each moment revealed a whole new world for meditation. It was the perfect time to call one of our children to strive to describe what we were witnessing. Happily, we were able to reach Veronica. My meager words could not possibly do the scene justice, but I could describe the way distant Boulder Mountain disappeared into the ether as the sun set, or the way the shadows of the hoodoos stretched across the landscape until all was united in darkness. Even in darkness, though, the figures were omnipresent. I felt like we were surrendering once again to Nature’s majesty. The icing on the cake was the star-spangled skies in the clear mountain air, so far away from any settlement. I’ve read recently that the most beautiful thing a human will ever see is Orion. I don’t necessarily agree, as there is so much to behold in this beautiful world and everyone sees beauty from a different paradigm. Nevertheless Orion and the Milky Way has a way of making me feel peace and humility at the vastness of it all. So what is a hoodoo, you say? 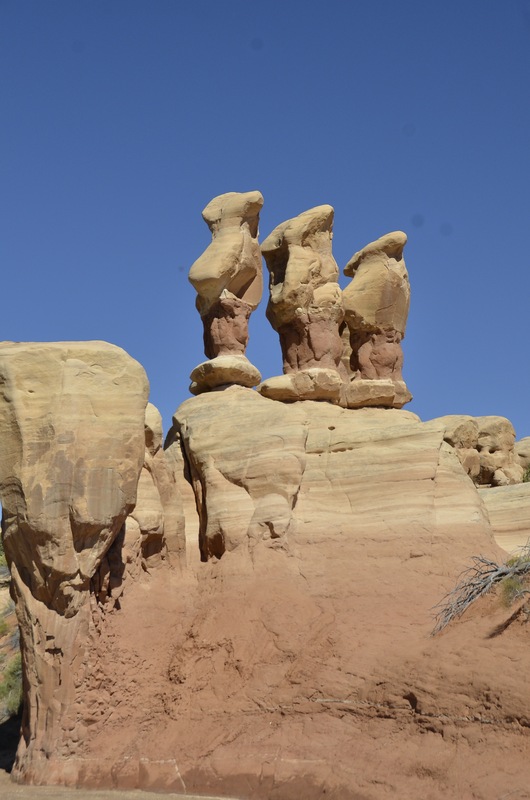 Hoodoos are another one of the amazing features the Utah desert presents for consideration. 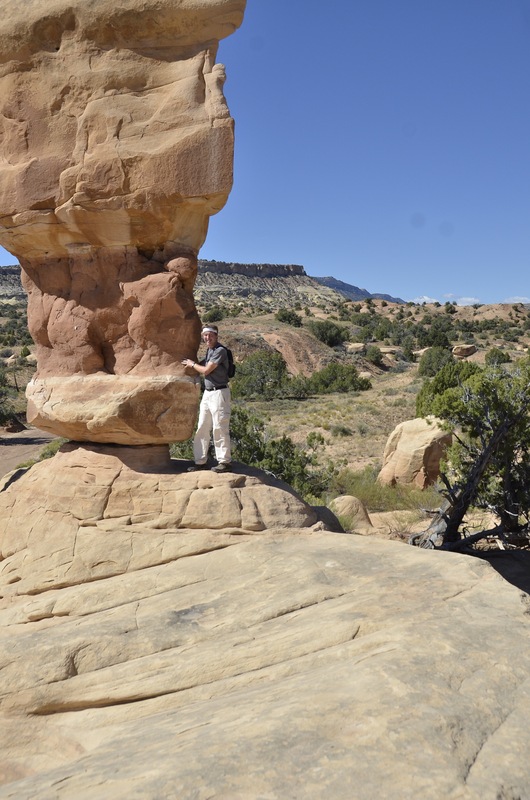 They are often seemingly impossible spires of sandstone that are often much bigger towards the top then at the narrow bottom. Call it nature’s balancing act. They can be as tall as a ten story building, as well. They are of course formed by the relentless action of wind and water, in the form of frost. They also can be aptly known as fairy chimneys, tent rocks or goblins. 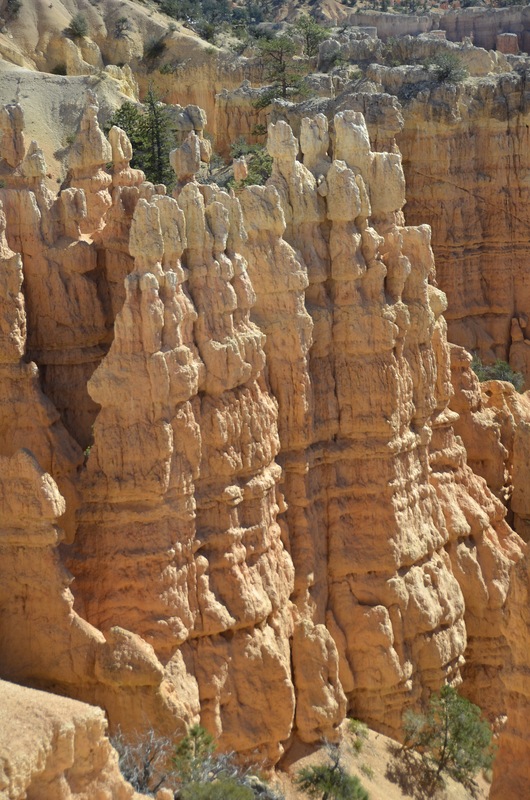 Hoodoos occur in sedimentary stone and the shapes are determined by the erosion of alternating soft and hard rock. 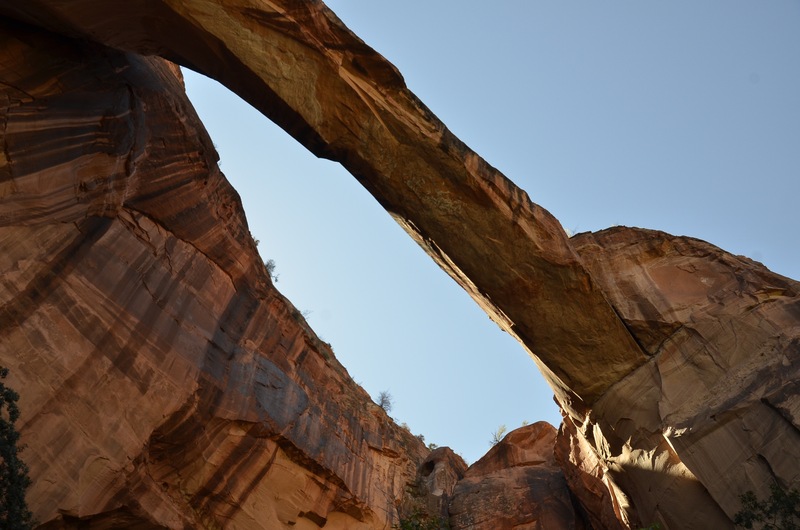 Mother Nature has also been hard at work sculpting natural bridges and arches. Here the softer stone is eroded beneath a connecting hard layer of stone, then voila, you have a natural bridge, after eons, of course. 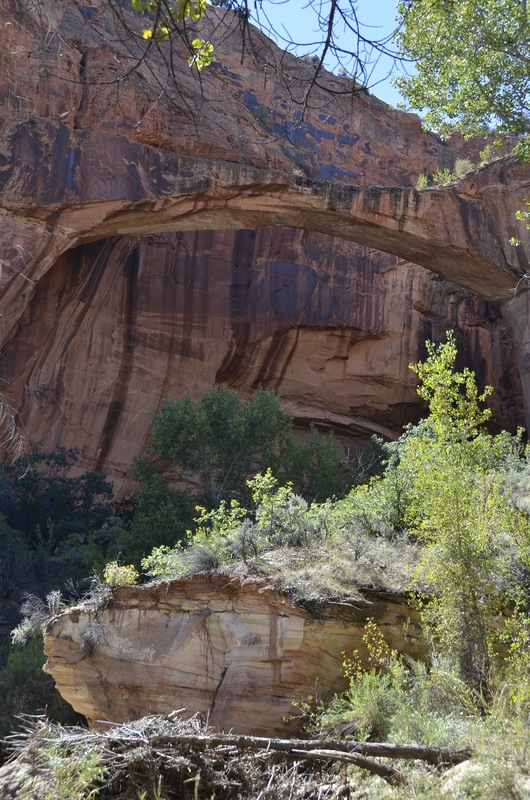 We saw an amazing natural bridge on our hike up the Escalante River canyon. This one was cool because you could climb into the canyon straddling it to see it from all vantage points. It was especially impressive from directly underneath. Today we saw a much more delicate bridge in the Devil’s Garden, off Hole in the Rock Road. It wasn’t long before we saw someone climbing the formation next to it. Thankfully they didn’t try to cross it! 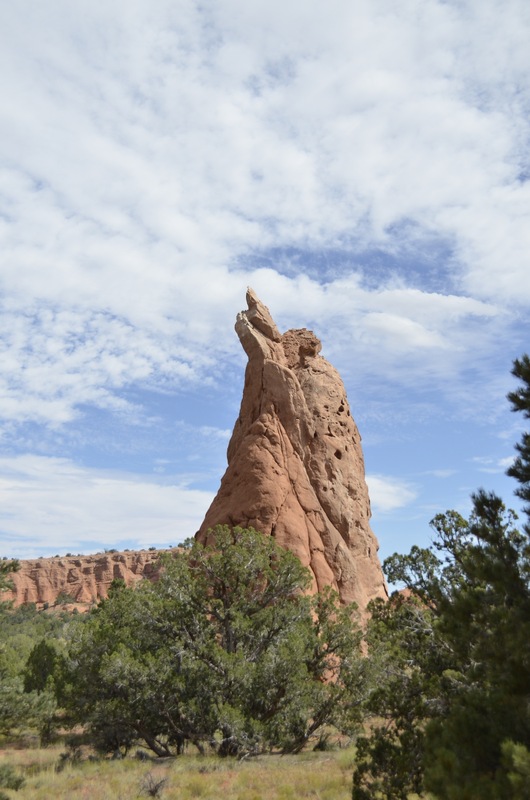 The Devil’s Garden is a really cool place, full of hoodoos and other formations. Here we could really see why some people call them goblins, for they looked very much like a troll or goblin frozen in stone for venturing out into the light. 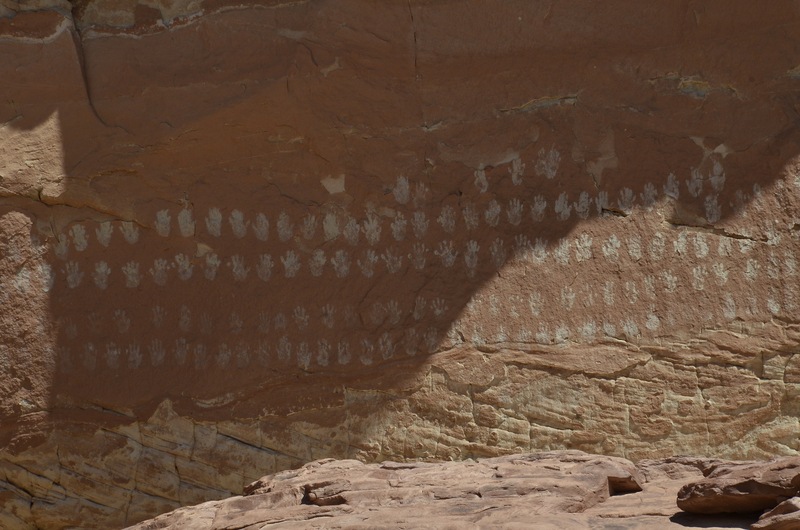 The Escalante River canyon is home to some amazing Native American rock art. Among the more impressive, and hard to find works is the “Hundred Hands.” Simply awesome. 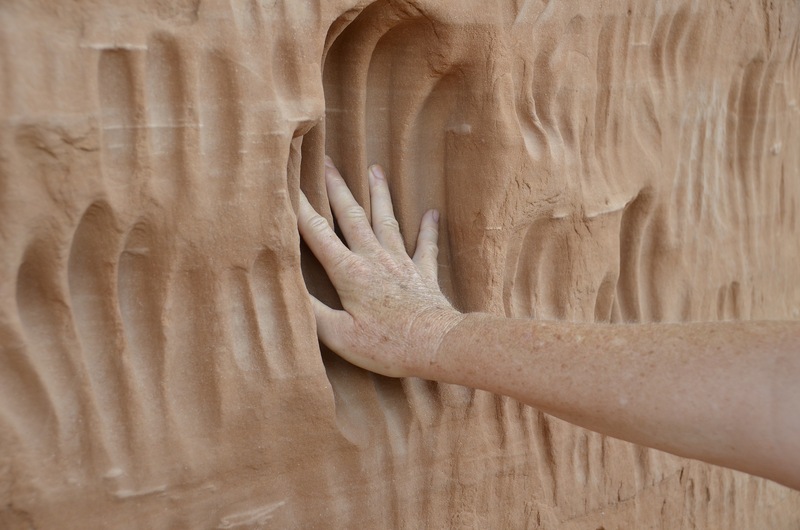 These are actually carved into the sandstone, so they are petroglyphs. Applied imagery is known as pictographs. Near the hundred hands were some more, mysterious, images. Let your imagination run with these! Finally, we made a run to Kodachrome Basin State Park, near Bryce Canyon NP. This was named for the film that came out about the time of a 1949 National Geographic expedition into the area. The name really fits! The last image is modern, not ancient art, near the entrance to a cave in Kodachrome Basin.